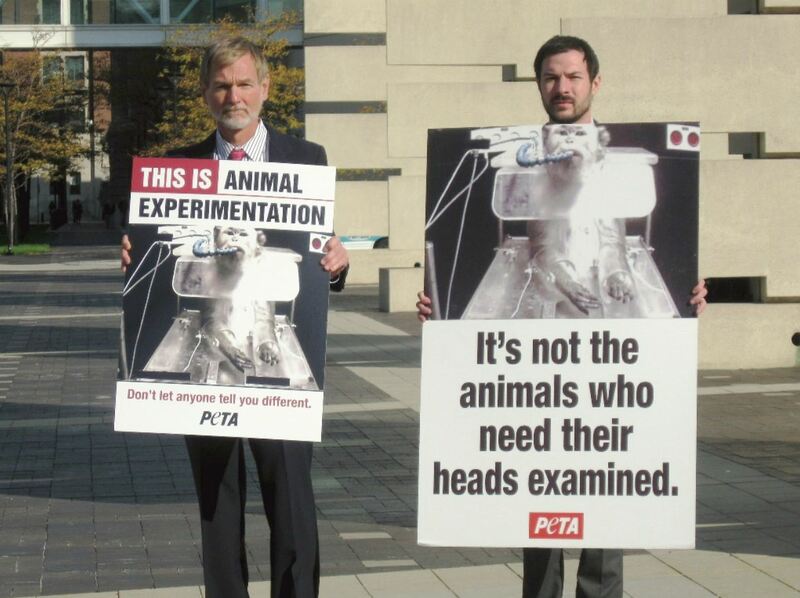 Dr. Lawrence Hansen, along with fewer than a dozen other anti-research activists from PeTA (People for the Ethical Treatment of Animals), demonstrated at the Society for Neuroscience meeting in Chicago. His opinion piece reveals that they were protesting neuroscience experiments on animals that, they maintain, will never benefit human health. In stark contrast, nearly 30,000 scientists from all over the world gathered inside the convention center to share their latest findings. Attendees ranged from winners of the Nobel Prize in Medicine, to patient advocates, to brilliant young graduate students. Clearly, those inside the convention center felt differently about the role of science and animal research in medical advancement. Our work centers around the basic functions of the brain, how it fails in disease and how we can develop treatments to everything from Alzheimer’s disease, to schizophrenia and drug addiction — horrific conditions that slowly consume human beings in front of their families, day by day, a little bit at a time. Dr. Hansen and PeTA contend that scientists perpetrate cruel experiments on animals merely because they have financial interests in animal experimentation. They are wrong. Our interests lie in finding out how the brain works and how to treat it in disease. Opponents contend that these questions can be answered using brain scanning methods in human subjects. They are wrong again. While brain imaging is useful for some applications, the real clues to disease are at the molecular and cellular level – processes not observable with magnetic resonance imaging or other non-invasive techniques. Animal activists seem to forget all these alternative methods have been develop by scientists themselves, including X-rays, tomography, and magnetic resonance imaging. These are all the products of basic research performed by scientists. Not by animal activists, not by physicians, but scientists. We would we refuse to use the tools we develop? Opponents say the use of animals in experiments fails to generate knowledge that benefits human health. This is simply false as refuted by medical history and simple common sense. All living organisms share the same cellular building blocks, and the mechanisms these cells use to communicate with each other are largely shared across species. Simply put, we are made up of the same stuff. While opponents are entitled to their own ethical position on the use of animals in research they are not entitled to their own set of facts. The fact is that without animal research, our ability to develop new cures will largely come to a stop. The fact is that there are no current alternatives to the use of animals when studying cellular and molecular events in an intact, living organism. If alternatives were available, we would be using them. Opponents of research have long been very vocal about their opinions, while scientists have remained largely silent. Not any more. The full story needs to be presented to the broad public who, we are convinced, will come to the conclusion that responsible research involving animals is crucial for the continued advancement of medicine and the health of both human and non-human animals. Posted on November 9, 2009 April 22, 2014 by EditorPosted in Animal Rights News, Campus Activism, NewsTagged animal model, animal research, animal rights, animal rights activists, dario ringach, Hansen, justin goodman, misrepresent science, peta, speaking of research. Yes thanks I do know a bit about the complexities of addiction, have helped freinds who are addicts and how complex this subject is. My point is that you lot bang on about responsiblities and how we as humans only deserve rights because we are so “responsible”. Many people (by no means all) overindulge and despite all warnings CHOOSE to abuse their bodies. That is their choice, they do deserve compassion and treatment if they want it. What they do not deserve (none of us do) is for an innocent being to go through hell because of their addiction. Either we are a species capable of taking on responsibilities and are therefore deserving of “rights” or we are not, which is it? Choosing toget off my faceon heroin despite health warnings and then expect a cure from animal testing when my body starts to fail and forcing others to suffer for my own inadequacies is not responsible. I must dispute some of your facts. In fact, the science of addictions has come very far in the past few years. It is now really quite clear that a variety of biological and sociocultural factors dramatically increase the risk that individuals will get “trapped” in addictions. For example, statistical genetic modeling has provided indisputable evidence that specific genetic factors make people more likely to develop an addiction if they try a drug. And we know that people are more likely to try and drug if they are born in an environment where drugs are readily available and visibly used (poor neighborhoods, families with rampant drug use, certain geographical locations). Yes, I ultimately concur with the notion that there is a ‘voluntary’ aspect to the early initiation of drug use, but so is there to HIV infection and certain forms of HPV-linked cervical cancer. After all, if people just remained abstinent, there wouldn’t be an issue for them, now would there? Does acknowledging that many HIV infections result from avoidable behavior mean the science should not move forwards? Should we avoid looking for a cure because it will – in your words – encourage others to “abuse their bodies”? If that is what you really mean, then I must say that I am quite shocked and horrified. Addiction is a horrible end-stage process that is hinged upon factors out of one’s control (genes, socioeconomic status, family environment, nationality, etc.) and – yes – upon some bad choices. No one wants an end to addiction more than those affected and those trying to save their lives. I believe that we are doing the RIGHT THING in tackling this insidious problem, and I consider it a major accomplishment when my work helps even a few people escape from this trap. Wow Lynn, you really are humanitarian of the year. “don’t worry, eat want you want, drink what you want, screw your health up as much as you want and we will torment and kill others to find cures for your self inflicted diseases”. If someone gorges themselves on crystal meth unless they are mentally incapacitated they know full well that they are kiling themselves. Why should animals have to suffer? If someone has a “food addiction” (used to be called gluttony), again they have chosen to stuff themselves why should animals suffer? Furthermore by looking for “cures” and implying illness where people have chosen their lifestyle choices is this not disempowering? Is not the argument so oft cited that humans have rights because humans have responsiblities? So what responsibilties does a man who weighs 50 stone and can’t even get out of his house have exactly? Ditto someone who chooses to sniff coke 3 times a day before mugging old ladies? I DO believe that such a person does have rights, needs care and compassion, what he does not need is to be told that he is ill and needs an animal reseach based cure.